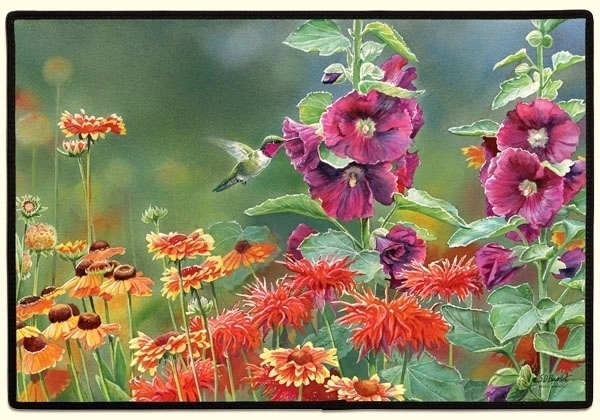 "Hummingbird Doormat" This doormat features a hummingbird fluttering about an array of beautiful flowers. This makes a great gift for the bird lover!!! 100% Polyester face, permanently dye printed fade resistant, non-skid rubber backing, durable polypropylene web trim. Measures 27" Long x 18" Wide x 1". PLEASE NOTE: Shipping ONLY within the continental U.S. Hawaii, Alaska, and Puerto Rico residents please contact seller for shipping quote before ordering.